Trying alternative methods, focusing on your collected information, accessing remote areas and getting closer to bedding areas can all offer great opportunities at a pressured, mature buck. Wouldn’t it be nice to own thousands of acres of private land that only you and your buddies could hunt? Of course, for most of us, that will never happen. So we resort to public land or crowded private properties, which ultimately educates the mature bucks. They come to realize they’re being hunted. Deer may become nocturnal, much more cautious or they may even completely abandon and avoid an area all together. As a hunter, you have to learn to recognize these signs and determine how to capitalize on them. With years of experience hunting pressurized whitetails, I’ve finally learned some tricks that help me succeed when others find fallacy. Trail cameras can provide us with the confidence that deer are in the area, but they can also falsely lead us to believe deer are not there, when truthfully they are. That’s why trail cameras work well as a supplement, rather than a tool that’s relied on entirely. This past season, we hunted a 14,000-acre public land parcel in New York. We attacked the bedding areas and areas we were familiar with having seen mature bucks in these areas during previous years. Unfortunately, we just were not seeing the deer we were used to seeing. We resorted to using night vision binoculars from X-Stand Treestands, spotlights and of course trail cameras to survey the area for deer at night. The biggest data that helped us, however, came from the trail cameras. We had over 37 two-and-a-half-year-old bucks on our six trail cameras that we did not once see with our own eyes. So, what did this information tell us? Well, 95 percent of the images were taken at night. Although the trail cameras showed deer in the area, they were waiting until the hunters were gone to begin roaming the property. From here, the best option is to continue to move your trail cameras closer to the bedding area. Once you begin getting close enough to their bedding areas, your hope is that it takes them awhile to get there. If you can capture them when they first get on their feet, this can give you a look at exactly what time they begin moving. Once you capture some daytime images, it’s time to capitalize and set up with that information. Where hunters are plentiful, deer are not only trying to avoid heavily hunted areas, they will also continue to educate themselves with each and every encounter. For years, hunters have been told by writers and other media that they should hunt deer between food sources and bedding areas. Early season, I would agree with this; although I’d also add that getting over feeding areas can be a great place to start as well. But as hunting season unfolds, crops are harvested, food sources change and deer become pressured. When this happens, deer will often hold tight to where they feel safe a little longer than normal. Of course the rut can often change this but, for the most part, deer that become nocturnal do so to survive. As the deer hold tight to these bedding areas a little longer your job is to find when and where they are entering and exiting this area. The downfall? You may only get one or two chances to capitalize. Once a mature buck feels pressured, knows he’s being hunted or detects the presence of a predator in his sanctuary, he will vacate the area. This is why hunting bedding areas can offer great rewards, but not without great risks. If you can get in there undetected and stay as scent free on the downwind side, your chances of success will increase on these pressured whitetails. Most areas that see a lot of hunting pressure are hunt sites easily accessible to hunters. Those who are limited by time, or just don’t like to stray far off the beaten path will stick close to the road and trails that make it easy for hunters to get in and out. For those who are more daring, going off the beaten path can bring high rewards. Consider finding locations situated away from roads and trails. Areas that are at a greater distance from access points can see less hunting pressure providing sanctuaries for deer to occupy. Another option is finding areas that not only are farther away, but present terrain that likely deter some hunters. On a map, this would be a steep climb or descent. You will find more hunters are willing to climb up on their way since this makes for an easy drag out of the deer woods. So finding an area that would make a difficult walk or drag out can offer secluded areas. Lastly, if you treat the blue lines on the maps as access points instead of barriers, you can open yourself up to areas that seldom see hunters. Rivers, creeks, streams, lakes and ponds — all offer a great way to sneak into areas undetected. Access by water can also help you hunt areas that have rarely been hunted, if at all. 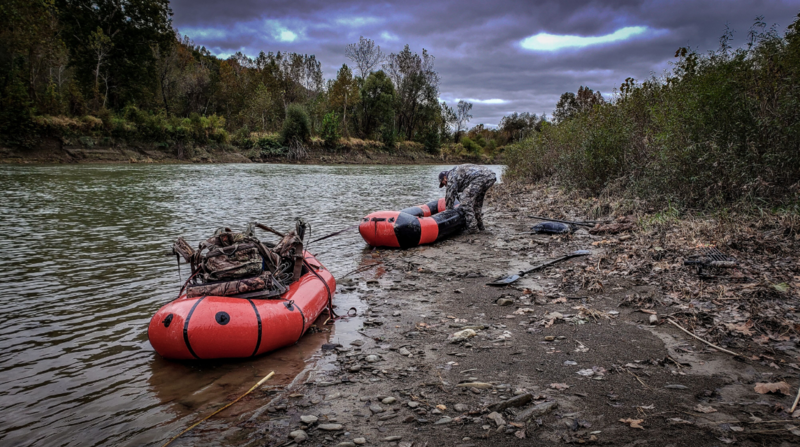 I use the Alpacka Raft Series when I'm entering a hunt site by water. They not only are nearly indestructible and pack into my backpack, they also provide enough buoyancy to keep me, my gear and the weight of my deer afloat as well. The system is quick to inflate, deflate and move around the deer woods. Deer know when they are being hunted. Research says as much. These animals know the property much better than any hunter and whitetails can smell you hundreds of yards away. I’ve watched a mature bedded buck upwind of me, but downwind of my buddy by 300 yards as he walked to his deer stand. That deer smelled him and immediately headed in the opposite direction. Your scent is vitally important. With that in mind, deer know when hunters enter and exit, they know where they are and often times they will wait to move until you leave. Most of the time this is into the evening hours, but also most hunters who hunt for a couple hours in morning and then leave can kick up some activity. The hunters who sit all day, hunt longer into the morning or even arrive when most hunters are heading out of the woods, can increase their chances at a mature buck as well. A Quality Deer Management Association (QDMA) study logged deer activity through collared deer monitoring, and found that deer often, “go back to normal,” in roughly three days. So if deer see a lot of pressure on Saturday and Sunday — when the majority of hunters hunt — expect a return to normal deer movement three days later. Thus, making the middle of the week the best days to hunt in areas that see a lot of weekend hunting activity. As hunters, we try our best to learn everything we can about the mysterious whitetail deer. And no matter what we do, we just can’t seem to figure them out. One day they can be plentiful under your favorite treestand, and then the next day they don’t seem to even be in the same county. Trying alternative methods, focusing on your collected information, accessing remote areas and getting closer to bedding areas can all offer you a great opportunity at a pressured hunted whitetail.